Though “Fast Food” in modern English usually describes paper wrapped greasy food products peddled by clowns, the term does have a much longer history. The oldest known use of the term “Fast Food” has been discovered inside France’s Lascaux caves, though the caves are famous for 20,000+ year old wall drawings, a stone slab formation deeper in the cave had never been investigated until recently, scientists believe it to be some sort of primitive dog house. Anthropologists suggest since man lived nearer the cave entrance than this dog, it could mean that man, was protecting the dog, possibly even worshiping him. 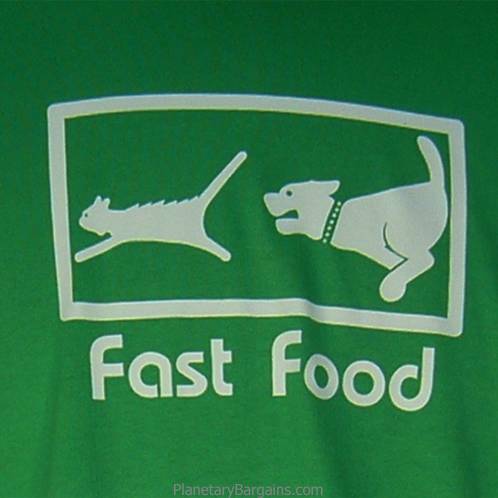 An image, is etched inside of the dog house of a dog chasing a cat, captioned,”Fast Food”. The well chewed etching tool found near by, may have been used by the dog. This may also explain the importance of the word “Dog” spelt backwards.